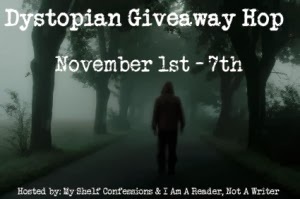 Thanks for stopping by my blog on the Dystopian Giveaway Hop, Hosted by My Shelf Confessions & I Am a Reader, Not A Writer. YA Dystopian are some of my favorite books to read. So I compiled a list of a few of my favorite series. My winner will have their choice of ONE of the books listed below. I listed the 1st book in the series, however if the winner already has that book, I may be willing to send the second or third book in each series as the prize instead. FYI I am sending the winner a NEW PAPERBACK copy. My only rules are the winner of a paperback copy MUST have a U.S. Mailing address. If the winner is international, you will receive a $10 Amazon gift card instead of the book of your choice. As of today, I really like Not a Drop to Drink by Mindy McGinnis. Thank you for this giveaway! :) - cindy c.
Either the Shatter Me or Hunger Games series! The Hunger Games trilogy by Suzanne Collins and Ashes series by Ilsa J. Bick are my fav. I liked the Hunger Games trilogy. Cinder the lunar series. THanks for the giveaway! The Hunger Games is my favorite so far. Thanks. My favorite dystopian series is probably Legend by Marie Lu. I loved the Hunger Games series! Thanks for this amazing giveaway - I would love to win! Divergent Series and Hunger Games of course! My favorite dystopian series is definitely the Immortal Rules by Julie Kagawa!